Get The Best Soil Tester So You Can Have The Healthiest Plants! Comes With Free Soil Guide! 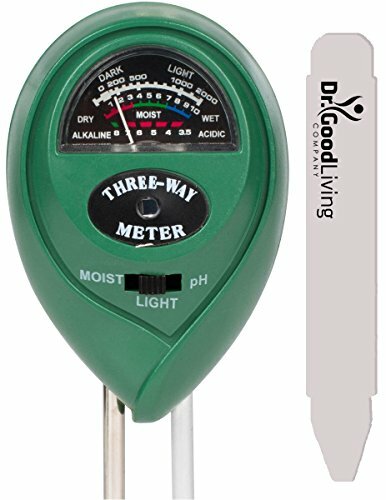 This 3-In-1 Soil Moisture Meter, pH meter, and light sensor will help you test any soil, and help your garden grow. - Allows you to make sure your soil has the right amount of water. - Helps you adjust the pH of your soil, so your plant / flowers can flourish. - You can make sure your plants are getting the right amount of light. Manufacturer includes Free Soil Guide & Downloadable Ebook! - Learn about the different types of soils. - Know how to make your plants or flowers grow faster, and healthier. Click The Button Above And Get the best 3-In-1 Soil Moisture Meter Now! Simple Soil Testing: This 3 in 1 meter makes testing the soil very easy! You can measure the soil moisture, pH, and light levels in seconds, so your plants can grow healthy and strong. Free Soil Chart (on back packaging) + Downloadable Ebook Included By Manufacturer. No Batteries: Simply push the meter into the soil, and you'll get your reading. There's no need for batteries like some other meters. Compact for Indoor, & Outdoor Use: Know when to water, adjust pH, or change lighting for your garden, flowers, plants both indoor and outdoor. Learn About & Test All Types Of Soil. Extra probe on meter allows it to test all three important elements of the soil. Great tester / test kit / hydrometer. If you have any questions about this product by Dr. GoodLiving, contact us by completing and submitting the form below. If you are looking for a specif part number, please include it with your message.